Amidst the mountains of Alto Adige, in the town of San Giovanni, there is a place entirely devoted to wellness & relaxation. 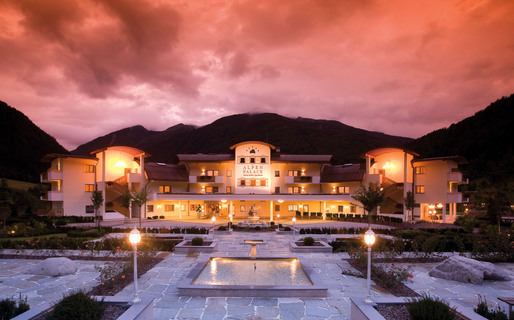 The Alpenpalace Deluxe Hotel & Spa is encircled by a 30.000sqm park, featuring a magnificent Baroque Rose Garden complete with playful water features, and a herb garden where the Alpine herbs used in the dishes which are served in the hotel's gourmet restaurant are grown. The biotope of the hotel enables guests to experience the natural environment of the Valle Aurina, one of the best-conserved areas of Alto Adige. The wellness dimension of the Alpenpalace hotel commences in the Spa Garden, open all-year-round thanks to its heated flagstones, swimming pool and Jacuzzi. The Water World includes an indoor pool with a waterfall, air massage and an aquatic area especially designed for children. 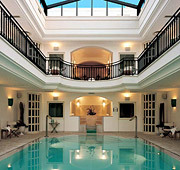 The Spa Alpin provides an ample menu of treatments designed to restore optimum energy levels and promote natural balance. In the beauty farm, treatments are performed using the exclusive products by La Prairie and Alpienne. Not to be missed: the Spa Alpin's fragrant wellness baths, such one which uses hay flowers, or the Serail bath, which is inspired by middle eastern wellness rituals. A healthy and rejuvenating experience awaits guests in the hotel's Salt Works the walls of which are lined with blackthorn branches trickling with salted thermal water. Next to the Salt Works there is a Brine pool in which to float, lulled by the sensation of weightlessness, as light as the clouds of the Valle Aurina.